The Renaissance Leather Skirt Hike is used to keep your skirt out of the mud. It has never been easier than using our Skirt Hikes! Use two in front for a too long skirt, or use one to show off a colorful petticoat or even (gasp!) a trim ankle. 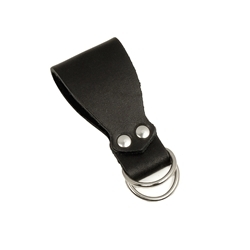 These Renaissance Leather Skirt Hikes can also be used for holding or tying other gear to your belt. Handmade in the USA. * Can Hold Mugs, Pouches etc.